In 2008, I attended a meeting in Madrid, Spain that featured the coolest demonstration I had ever seen. The problem was that I wasn’t allowed to talk about what I had seen because the company was still in stealth-mode. More importantly, several governments, including the U.S. government were still exploring various parts of the technology for next-generation computing systems, so parts of this were very confidential. By the end of that year, Oblong Industries had revealed itself, but still little was said about its project. Finally, people are starting to talk about it. Other systems, including Microsoft’s Project Natal for Xbox, are promising similar types of gesture interaction as soon as this year. But the reality is that a system anywhere near this solid is probably still years out. 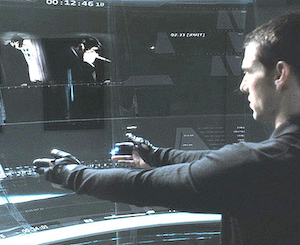 Minority Report, the movie, takes place in 2054, for example. And while that is just a movie, Spielberg instructed the people working on the tech for it to really try to come up with what they thought we’d be using in that time. That said, Underkoffler told Bits that “I think in five years’ time, when you buy a computer, you’ll get this.” Of course, that’s the entrepreneur talking. For now, I’ll just have to continue to dream about using a computer like they do in Minority Report. But the dream is getting closer, it seems.